A killer loss of a two at the last end saw Ireland got down to Austria after a topsy-turvy game in the C Division in Romania. 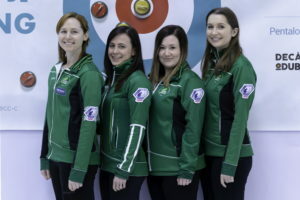 The team of Alison, Jen, Jacqui and Katie kept a slender advantage throughout most of the game, despite losing a four in the second end. Jacqui in action. Photo credit WCF. The woman are second equal in the table with Slovenia and Slovakia and face Slovenia in the morning.